Ladies, I know you feel me: when it comes to skincare, you could easily fill a giant beach bucket with all your favourite and "necessary" products to keep your skin young and fresh. But when that times come around for a vacation, packing all of those necessities into your suitcase – or heavens forbid, your carry-on! – you might have to give the word "necessity" a second thought. I recently did a trip to Canada's metropolis cities out East (Toronto, Ottawa, and Montreal) to celebrate #Canada150, and as if my a perfect alignment, I came across Rocky Mountain Soap just prior to my departure. This Canadian, all-natural skincare and soap company is not only completely toxin-free – their products actually work! I got to know the perfect on-the-go skincare for travel, which comprises of just three, all-natural products! I am thoroughly in love with this day cream, and I can honestly say it makes my skin feel the way it used to – when I was in my late teens/early twenties, and my skin was undoubtedly bustling with a lot more collagen. The pomegranate day cream is an awesome travel companion. I always find that my skin dries out or becomes imbalanced when I'm traveling, and this day cream is ideal for instant hydration. The best part is: a touch of this cream goes a long way! Yes, the delicate skin around your eyes requires a different skincare product to battle signs of aging. I've always been a HUGE believer in eye cream, and I've tried at least 100 different kinds in my lifetime. Also an all-natural product, the eye cream from Rocky Mountain Soap has ingredients like coconut and jojoba oils, ginseng, and green tea, and provides instant and long-lasting hydration. It works wonders for ridding your under-eyes of that sleepy, puffy look in the morning, and is great for overnight as well. I especially love that it comes in a jar, and again, a little goes a long way! At some point, I stopped using toner, but now since I've reintroduced it back into my skincare regime, I can't fathom why I ever stopped. The Hydrating Toner from Rocky Mountain Soap comes in a great mist bottle that is both refreshing and convenient. 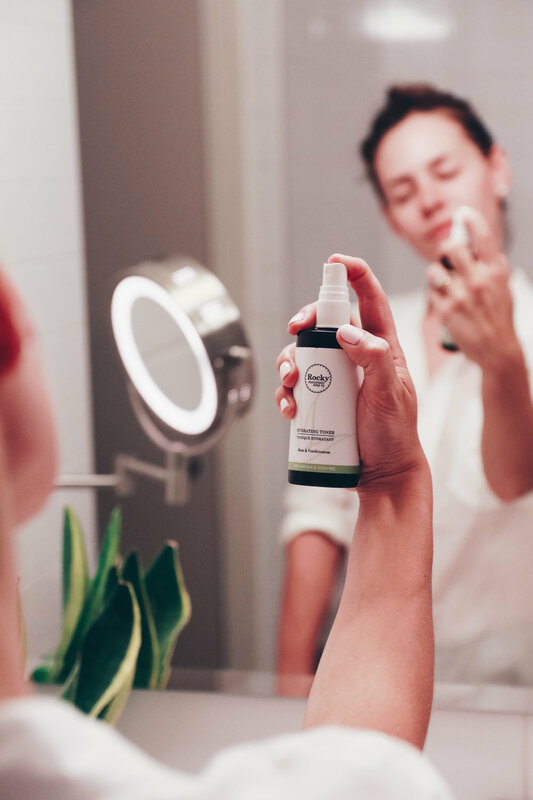 Applying a few spritz after cleansing is the perfect way to replenish your skin's moisture barrier and add antioxidants for healthier, more hydrated skin. This also helps with cutting down how much moisturizer you need to apply to your skin after cleansing. There you have it: just a small handful of all-natural yet robust products that will do your skin wonders during your travels (and likely have you hooked for life! ).